Plot is the architecture of film. Christopher Nolan’s latest, Inception is nothing if not architectural. Its characters inhabit a labyrinthine dream world whose every detail has been conceived, blueprinted and constructed with exacting precision. Each new scene stacks on top of the last, rising from the architect’s master plan – brick by brick, building by building – until all Inception’s characters can hope to do is to survive inside its bustling metropolis of ideas. Inception’s many main(ish) characters are a team of specialists whose work is a form of dream espionage. They are hired to penetrate a subject’s dream world and extract information locked away deep inside the mind. All the while, they must evade the many hostile “projections” – specters of the dreamer’s subconscious out to eradicate the invading parties like antibodies purifying the blood of disease – and escape with the secret key. Everything in these dreams, down to each fiber of carpet, is designed by architects who create the worlds in which the dreams occur. Like Nolan, their goal is to craft a maze of realities that fools the viewer/dreamer. To avoid corrupting the operation, the architect is the only one who knows the details of the maze. The world appears real, but it wraps around and back in on itself. It is a closed loop by design – a mobius strip. Much of the film takes place within several layers of the dreamworld. There are dreams, dreams within dreams, and dreams within dreams within dreams – the pure subconscious mind. Among these dream worlds, characters are drawn and backstories emerge as an attempt is made to flesh out a few of the extractors as real people with emotional motivations that we can empathize with. But all the effort by some wonderful actors can’t save the characters they play from being primarily a device for plot and secondarily a character. Even the main character, Cobb (capably handled by Leonardo DiCaprio) never emerges as fully formed. His story of loss feels forced into an already crowded world of action. He and his team have so much to do. There are so many wheels that need turning and buttons that need pushing that they may forget why they’re pushing them in the first place. Perhaps this is also why they need to explain it to us. We both need to be reminded of why they’re there as they blow up buildings and outrun snowmobiles. In the end, this is why Inception fails to have an impact. Like a dream, the aftermath of the experience (while vital and utterly real at the time) is fuzzy and fades away into the day as you wake. If Inception’s characters were heavier or thicker or more real, maybe they would stay with us. Maybe the story we witnessed would’ve had something to be connected to – something to give its ambitious ideas some resonance. We are told in the film that to implant an idea – to achieve “inception,” – the subject must feel that the idea was his/hers, or it won’t stick. The same is true for film. We need to feel the characters we watch as if they were us. We need to be able to reach that magical transference that truly powerful characters can manifest where their pain and joy is our pain and joy. Christopher Nolan is capable of this. His previous film, The Dark Knight, is also an action film, but with rich characters whose fears and desires are vivid. Their motivations propel the narrative, but rarely feel like character development. Even in the fantastic world of Gotham City, they feel real to us. Unfortunately, Inception ultimately leaves us on the outside looking in. Like a dream we aren’t in, we just get to watch everybody running around. While this may be incredible and even amazing, if it doen’t truly move us it cannot stick. The characters keep desperately pushing the plot along, but it’s hard to care. An intricate machine is at work, but its creator was so fascinated by its mechanics, he forgot to ask if the task this machine was built to perform was worth doing at all. The cast of "The Breakfast Club"
Roger Ebert called The Breakfast Club the My Dinner With Andre of the teen film. In some ways he’s absolutely right. The Breakfast Club, starring what came to be known as the “brat pack” was essentially a plotless film. Like Louis Malle’s Dinner, in which two men have a conversation in a restaurant for the entire film, nearly all of John Hughes’ The Breakfast Club takes place in one room – a high school library during Saturday detention. 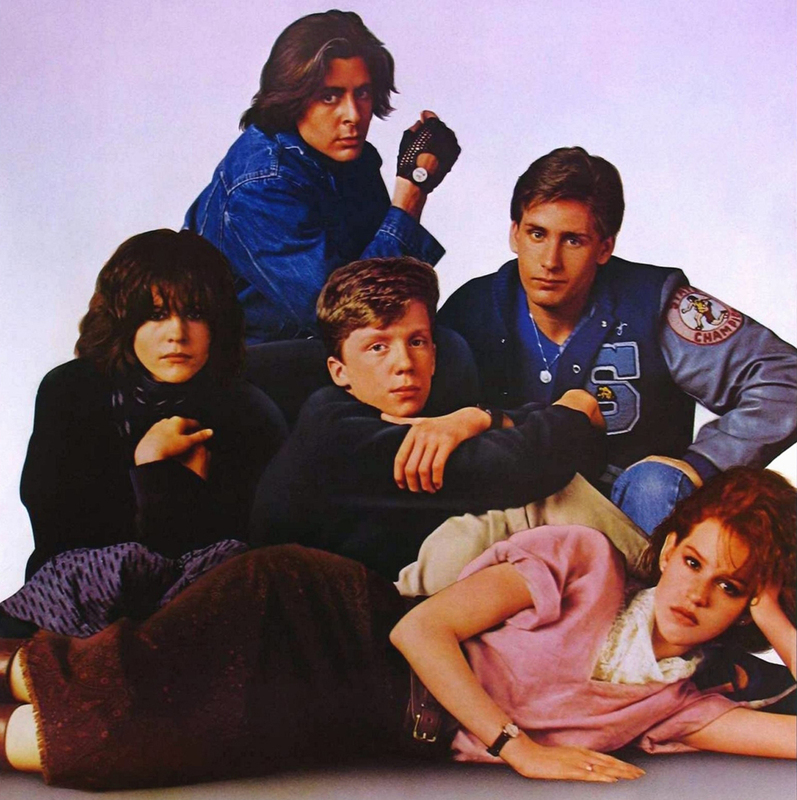 On the surface, each of the five main characters fits neatlty into a 1980s high school social category – as the poster says, “A brain, a beauty, a jock, a rebel and a recluse.” During the course of the film, each character breaks our expectations of them by revealing personal and emotional details to classmates. Under normal school circumstances they would never cross these social boundaries, and therefore know absolutely nothing about the people living behind the roles they play in the drama of high school. One by one – either willingly or through coersion – they take turns offering a up a secret picture of their own damaged and vulnerable inner lives. There’s no action. Nothing really happens – just talk. This is about all the plot we get from The Breakfast Club: five crudely stereotypical characters breaking type. It would have been difficult for Christopher and Jonathan (his brother and writing partner) Nolan to convince a studio to fund the extremely costly Inception prior to the box office and critical success of the Batman films. However, it seems impossible for a major studio today to greenlight the insanely cheap (in comparison) film John Hughes would have pitched: “five teenagers find out they’re more similar than they thought by talking to each other for 2 hours.” No explosions, no mysteries, no mazes, no mayhem; just kids asking themselves “Are we going to become our fucked-up parents?” each taking turns being John Hughes. Although The Breakfast Club may seem like a blunt object when compared to Inception’s intricacies, its simplicity is one of its biggest strengths. It relies on writing, dialogue and performance to make its characters come to life (not to belittle John Hughes as a visual director, but it is basically a filmed play). And through the course of the film, each character gives us a reason to be them and to feel their stories from the inside. Like Inception, there are several main characters, but unlike it, we feel for all of them and leave having understood something real about them. The ultimately shallow impact of Inception is not the fault of the actors, but of the script and the secondary importance the film gives to character development. Although the world these characters inhabit is literally created from their minds, they remain projections inside it. There is very little there except set pieces, action sequences, and exposition. It’s all very interesting, exciting, and even stunning, but even the film’s main main character, Cobb struggles to experience his own pain rather than explain it to us. This doesn’t mean Inception is a bad film or even not a good one, but it does limit what it can do. I cannot think of a great film without a strong and lasting sense of character. (Readers, if you can, add them to the comments section). Even Blade Runner – a film which could have very easily been overpowered by its ambitious aesthetic and difficult source material, or done in by the weight of its own ideas – remains a powerful and relevant work largely because its characters (replicant or not) are alive. The nature of their inner lives is the main question of the film. What is inside them? Are their emotions real even if their memories are not? Without this as its core, it could still have been a beautiful and probably groundbreaking film, but it could never have embedded itself so deeply into our cultural consciousness. I can’t think of a film that doesn’t have strog charcters that sticks with me either. i loved watching inception but also walked away without achieving “inception”. i wonder if this film would have worked better as an episodic tv series where we could really have time to understand the set up and then follow the characters for longer. great article. want to watch breakfast club again!